Wohoo! Huzzah and well done, fellow NaBloPoMo-ians! 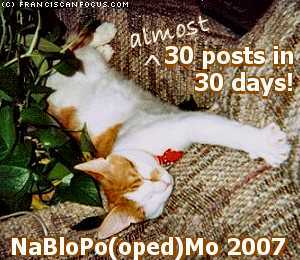 We made it to the last day of November and the end of NaBloPoMo! Looking back over my daily posting efforts, I'm almost pleased with the results; I copped out quite a few times and threw together completely pointless/silly/meaningless stuff Just To Have A Post. And technically, I don't really qualify for having fully completed this year's NaBloPoMo because 1) I didn't find out about it until 3 November, and 2) I completely forgot about posting on 17 November. But, what the hey. I played along as best I could, and it did force the ol' grey matter into extra action, for which I'm grateful. Thanks for readin' along! Cheers and whistles for you, Lisa! I know how hard it is to fill a blank page on a daily basis. I've been doing it for a few months now and it never gets any easier. See you over on Facebook. You have been nominated for an award. Go to my blog and see today's post, and no, its not some hokey chain letter! Hey, thanks Steve! Blogger didn't notify me of your comment (gaaah!) so I only saw it in the queue when I logged in to write yesterday's (12-Dec-07) post.